Scientists examined images from observations of Newton crater (at 41.6 degrees south latitude, 202.3 degrees east longitude) shot by the High Resolution Imaging Science Experiment (HiRISE) camera onboard MRO. The time span of these images extended from early spring of one Mars year to mid-summer of the following year and reveal thin (‘finger like’) geological variations that appear and develop down some slopes during late spring through summer, fade during winter and reappear the next spring. Repeated observations have tracked the seasonal changes in these recurring features on several steep slopes in the middle latitudes of Mars' southern hemisphere. The features imaged are only about 0.5 to 5 meters wide, with lengths up to hundreds of meters. The width is much narrower than previously reported gullies on Martian slopes. However, some of those locations display more than 1,000 individual flows. Also, while gullies are abundant on cold, pole-facing slopes, these dark flows are on warmer, equator-facing slopes. "The best explanation for these observations so far is the flow of briny water," said Alfred McEwen of the University of Arizona, Tucson. 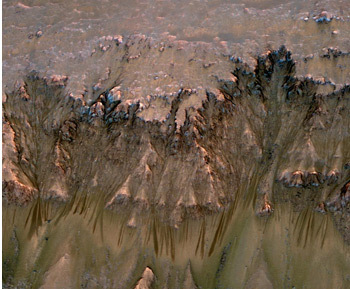 McEwen is the principal investigator for the orbiter's High Resolution Imaging Science Experiment (HiRISE) and lead author of a report about the recurring flows published on the next Science magazine. There are still many questions, but flows of liquid brine fit the feature's characteristics better than other hypotheses because saltiness lowers the freezing temperature. Also previous robotic missions have establish that the Martian surface is largely salty so any flowing water will be saline. In the map above (higher resolution and legend here) the colored squares indicate areas with water related influence. The blue squares indicate where the possible flow of briny water may take place. 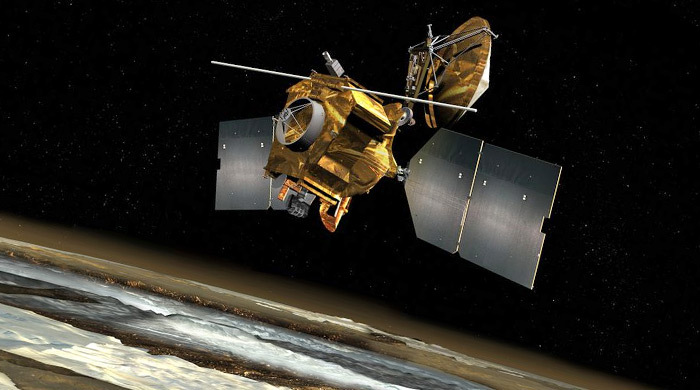 The Mars Reconnaissance Orbiter was launched at 2005 and is in orbit around Mars from 2006. 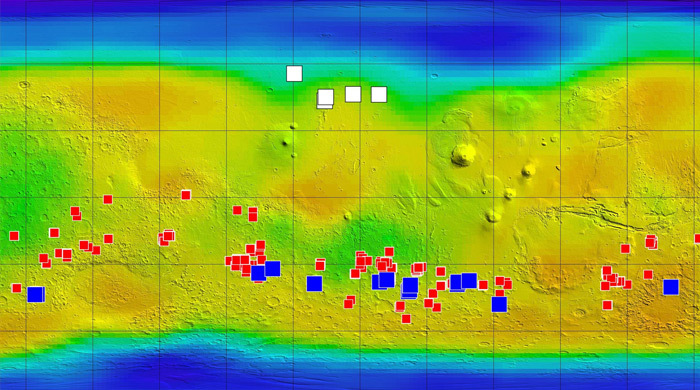 It has contributed a huge amount of data that enlarged our knowledge of Mars.